Secluded and peaceful haven for two! 1/29: Quaint and well equipped, all you need for the perfect beach vacation. 4/29: West Bay Beach looking North. 5/29: Step off your deck into the sandy front garden full of palms and other tropical flora. 6/29: Studio outdoor living with sofa and hammock. 9/29: The hammock is always shaded. 10/29: Comfortable outdoor wicker furniture. 12/29: Queen bed, flat screen with local Cable T.V. Wi-Fi included. 13/29: Small dining area, perfect for two. 14/29: Traditional louvered doors and windows. 15/29: Monkey Lala Studio just steps from the Caribbean Sea. 17/29: Kitchen area with space for food storage and prep. 19/29: Bathroom with traditional jalousie window. 22/29: Summer orchid, in the garden just off the deck. 23/29: Colourful fishing boats line the shore on some days. 70 steps from the water, Monkey Lala house is located in West Bay Village an oasis of privately owned homes on West Bay Beach. Just a moments stroll from bars and restaurants. Tucked away, this hidden gem is private and convenient, with an unbeatable location close to the amenities of West Bay Beach yet secluded and private surrounded by lush tropical gardens. Just 200 meters off the beach you will encounter amazing snorkelling & diving, exploring our reefs could not be easier! The Monkey LaLa Studio is the perfect spot for a single person or couple looking for budget pricing while still enjoying the amenities of West Bay Village and West Bay Beach. The Studio is modestly furnished with a queen bed and table and chairs you see in the photo. Inside you`ll find a kitchenette with a stove/oven, mid-sized refrigerator, microwave, blender, toaster and coffee maker. There is also a small deck outside with a hammock and wicker furniture. 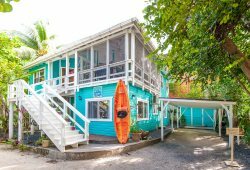 You may consider renting Monkey LaLa Studio in combination with the upper level home, Monkey LaLa, which in it`s entirety is a fabulous 3 bedroom Caribbean beach house. The entire staff at Island House Vacation Rental was AMAZING! Always friendly and always going out of their way to make sure we had everything we needed and that we were enjoying ourselves. Big shout out to Fernando who provided us with ideas and information we would not have gotten otherwise which made this a very memorable trip! Monkey La La Studio was exactly like the pictures showed. It was small but we spent such little time there it made sense for 2 people travelling on a budget. We could not get the oven to work, and I found the kitchen required more utensils like scissors and Tupperware. also, there was not anywhere to put clothes that did not require hanging. There may not be room for a dresser, but some additional shelving or hangers for 2 people would have helped. Overall the room was great though. REPLY: Thank you very much for the honest critique. We will update the kitchen utensils and include Tupperware and have maintenance scheduled for the oven. We will also be adding shelving for clothing. We'd love to have you back to see the improvements! The hammack fell down. Still hurts my back. RESPONSE: We are so sorry that happened. Our maintenance staff has checked all our hammock hooks as a result. Very nice site. In the day the site is very quiet and pleasant the only negative thing about the studio is given the type of window the outside sounds are stronger (especially at night), the air conditioning pump, the wind in the tree etc. Have become accustomed to it. The staff is very nice and smiling. Experience to remake it's sure REPLY: Thank you for your kind review, we hope to have you back with us soon! Everyone was helpful and friendly. We especially appreciated our daytime security guard, Francisco, and our housecleaner, Lourdes. The Momkey LaLa Studio was perfect for us. We loved being able to walk down the lane to the beach each day, and we enjoyed snorkeling and paddle boarding right off the beach! Island House staff is excellent. This is our 5th time renting from them and we will continue to do so. Looking forward to the next 5. The property is a studio but is well appointed and has a full kitchen. The only complaint we had was that there are no curtains over the window above the bed but we just hung up a couple of beach towels and that solved the problem for us. RESPONSE: Thanks for the honest review Mike, the owners are visiting next month (July) and bringing curtains for those windows with them. Everyone was very friendly and very helpful. Any concern we had was dealt with promptly. Great place just a few steps from beach Great place just off the beach but not too far as to be a problem going back to the room to pick something up you might have forgot. Semi-private with gated area entrance to the 6 or 7 houses that are on the property. The Studio is downstairs from the Monkey La La so expect some upstairs noise but its not too much. Room had fridge and kitchenette along with fresh water, beach towels, and satellite TV. Great little getaway for a couple looking to save a bit. Area provides beach chairs for all those on property and you ware within walking distance to snorkeling just off the beach and a number of restaurants along the mile or so beach. Only annoyance is the locals constant barrage of trying to sell shirts, massages, shells, trips etc. Most are OK but a few were a bit annoying. The rental company was helpful, organized and I would absolutely use them again. Charming bungalow a breath away from West Bay Beach They say it's location location location. During my most recent winter getaway to Roatan (my 5th in 2 years), my favorite tropical paradise, I tried out a West Bay vacation rental instead of my usual resort destination. No regrets, coyote. The space was quite suitable for my purposes and while initially a little overwhelmed by how small a space it was to share with someone else, it grew on me over the week I was there. Nice quiet neighbors, a 10 second walk to the beach and nestled right in the heart of West Bay, a great place to vacation. Posted rates do not include 19% Honduran tax, but `instant quote` will. Maid service once a week included. Security deposit $500 is required. Ask about monthly rental deals.